Although the popular notion is that Karate was initially developed in Okinawa , it's roots are thought to stretch back over 1400 years to Daruma, the founder of Zen Buddhism. Daruma travelled from India to China to teach Buddhism and taught his followers techniques to develop and strengthen mind and body, many of which are basic to modern Karate. His methods were taught in the Shaolin Temple in China , where they eventually developed into the fighting technique known as Shaolin boxing. These forms of fighting were known as Okinawa-te or Tode (Chinese Hand) and resulted in the formation of three distinct styles, Shuri-te, Naha-te and Tomari-te (named after the cities where the styles were practiced). The Shorin-ryu style of karate is though to have originated from Shuri and Tomari and Shorei-ryu from the city of Naha . The Shorin-ryu style consisted of fast, linear movements with natural breathing, whilst Shorei-ryu taught strong, rooted techniques with synchronous breathing. 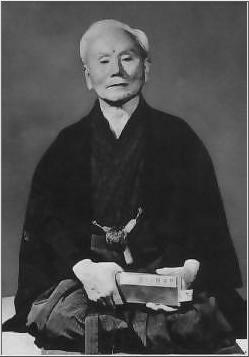 Gichin Funakoshi was born in 1868 in Okinawa and began to study karate at the age of 11. 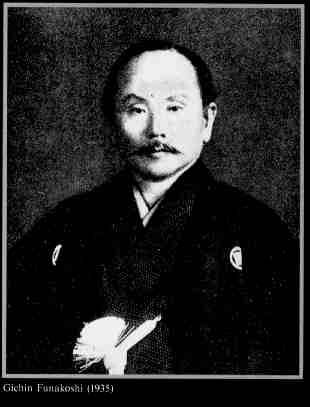 He studied under many great Okinawan masters of the time and rapidly became adept at both the Shorin and Shorei styles. In fact many of today's modern Shotokan katas have their roots in the original Okinawa-te or Tode katas. Tode could also be pronounced as kara and so Tode-te became Kara-te or 'Chinese hand'. Funakoshi adopted the alternate meaning for the chinese character for 'kara' which is empty and so kara-te came to mean 'empty hand'. Karate was first demonsrated in Japan in 1917 by Gichin Funakoshi at the Butoku-den in Kyoto . He was invited back in 1922 by Dr, Jano Kano, the founder of Judo, and remained in Japan to teach Karate at the Kodokan Dojo with the backing of the Judo master. Karate gained massive popularity with university students and Funakoshi continued to teach at various colleges around Japan . It is at these colleges and universities that many of the modern masters such as Nakayama, Obata, Noguchi and Watanabe were introduced to the art. World War II had a serious effect on the growth of Karate in Japan , as many of the former practitioners went off to serve in Japan 's armed forces. 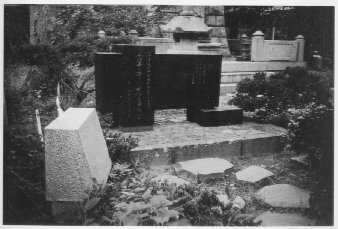 The additional blows of the death of Yoshitaka, the destruction of the Shoto-kan and the banning of Martial Arts by the conquering Allied forces, left Shotokan Karate in complete disarray. Master Funakoshi died in April of 1957. Engraved on his tombstone are the words "Karate ni sente nashi" or "There is no first attack in Karate". #10 Everything you encounter is an aspect of karate: find the marvelous truth there. Original Shotokan Dojo in Japan.